:: Graduate of Achievement: Maria D.
We are thrilled to recognize Maria D., a junior at Ursuline Academy, as a Graduate of Achievement! After graduating from our Academy program at St. Cecilia, Maria wanted to attend an all-girls high school that would challenge her and expand her horizons, and was accepted to Ursuline, a nationally-recognized school of excellence. To ensure that the school was and is a good fit for Maria, Mrs. Heidi Klosterman, her Graduate Support Director, visits often. “Heidi is very attentive and always makes sure we are putting forth our best effort and doing well on our grades. It helps motivate me,” said Maria. The challenging academic environment at Ursuline also taught Maria the importance of staying on top of her work and grades. She advises any prospective freshmen not to slack off in their studies. “I wasn’t unprepared for Ursuline but wasn’t prepared enough to take on the amount of homework that I have. I didn’t realize how important it was to have a 4.0 my first year to maintain a cumulative GPA high enough to earn the Ursuline Scholars Award. At the end of my freshman year, I had a 3.6 GPA and wanted the white sweater,” she said. Proudly, during her sophomore year, Maria was awarded First Honors for both the Fall 2016 and Spring 2017 semesters, and was presented the Principal’s Award for Academic Excellence for achieving a GPA of 4.0 or higher for both semesters. This year, she was awarded First Honors for the Fall 2017 semester and look forward to seeing her achievements this semester. We believe she is well on her way to earning the Ursuline Scholars Award. Maria is also active in a variety of extracurricular activities, including Project USS, a club that helps raise funds for students who need financial aid, and Posse, a club that helps encourage school spirit by making posters for games and cheering in the stands. 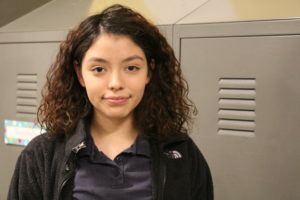 After graduating high school, Maria hopes to attend Washington University, St. Louis University, or the University of Missouri – Kansas City to study neuroscience and pre-med. “I find the brain fascinating, and don’t think many people realize how important it is, especially if it shuts off. I have heard a lot about tumors lately and want to help people,” Maria added. We are beyond excited for Maria and will continue sharing updates on her achievements!